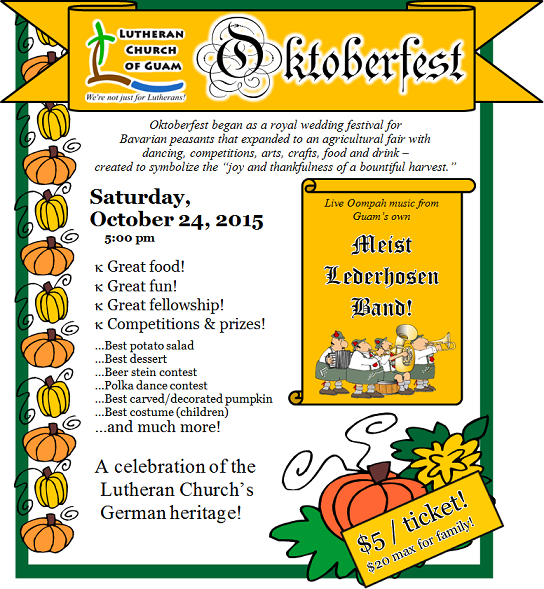 Oktoberfest is a celebration of the Lutheran Church’s German heritage, food, dance, contests, crafts, and FUN! Come Saturday, October 24, 2015, 5:00 pm. Tickets are now on sale, $5 per person, or $20 max for a family! There will be a sign up to enter the contest for potato salad, side dish, dessert, pumpkin carving, beer stein, and polka dancing! Fellowship committee has more info!